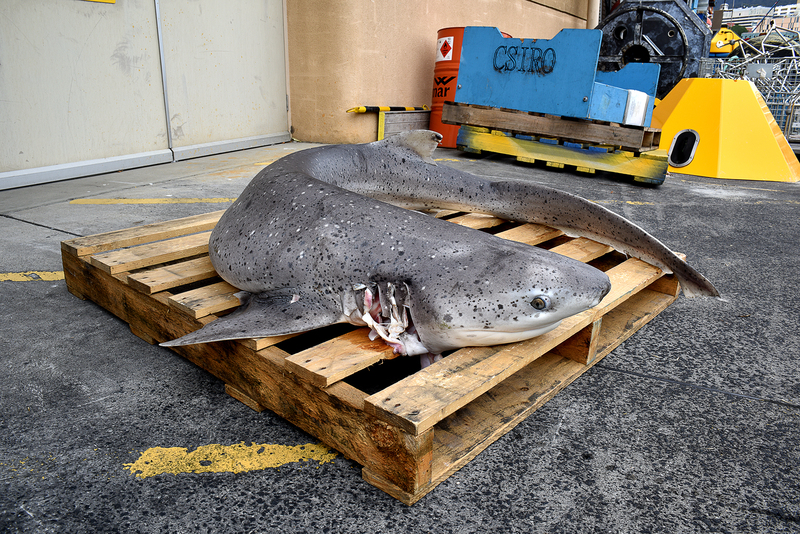 The broadnose sevengill shark on the wharf at our labs in Hobart. Staff arriving for work at our labs in Hobart last week were surprised to find a large shark had washed ashore near their car park. You might be wondering — on the shores of which lab did the shark wash up on? Our Australian National Fish Collection, of course. Staff instantly recognised it as a broadnose sevengill shark, and took it straight into the lab. Now we have the shark to thank for donating its body to research and conservation. “The shark was too large to retain whole, so we froze its head and fins for taxonomic and morphological studies, where we identify the species and describe its features. We also froze muscle tissue for future genetic studies,” said John Pogonoski, one of our ichthyologists at the facility. “Shark fins are especially useful to retain when the whole animal cannot be kept. If fins of this species are ever used in the shark fin trade, we can match them to the samples in our collection,” he said. 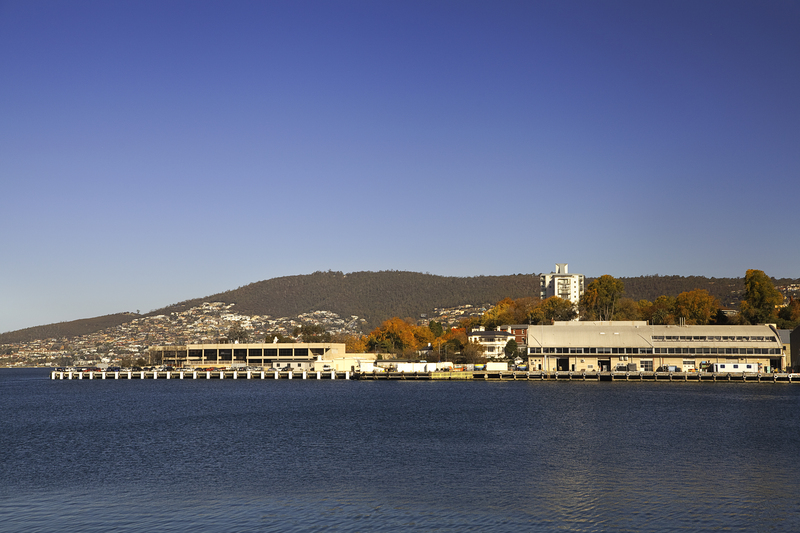 A view of our Australian National Fish Collection across the Derwent River. “Like other whole fish specimens in the collection, the fins will be fixed in formalin and stored in ethanol indefinitely. We might remove the flesh from the jaws and store them dried for examination of teeth, or we might decide to preserve the whole head in ethanol with the mouth open,” he said. Specimens normally arrive in our biological collections as the result of careful research collecting to help us understand and protect our region’s biodiversity. But sometimes specimens are donated by the public, usually birds or mammals that have been hit by cars. This broadnose sevengill shark was most likely line-hooked by a recreational fisher, either the night before or the morning that it was found. “The shark would have been gut hooked rather than hooked in the mouth because there was no visible damage inside its mouth. It’s likely the fisher cut through the gut to extract their hook and then threw the shark back into the water,” Mr Pogonoski said. “When we dissected the shark in the laboratory, it was obvious that the anterior [front] portion of the gut had been severed and removed. When we looked for stomach contents, there was no stomach,” he said. So what’s the best option if you hook a shark, or any other fish, and can’t see the hook in the fish’s mouth? Broadnose sevengill shark being measured before storage and analysis. “If the line had been cut above the hook and the hook left in place, the hook would have eventually rusted and the shark may have survived, but that depends how exhausted the shark was after being caught and how much damage the hook had caused to the gut,” he said. Sevengills sharks can grow up to three metres in length. This shark was an adult female, 2.4 metres long and was not pregnant, as no pups were found inside. This specimen joins three other sevengill sharks in the Australian National Fish Collection, all from Tasmania. While most sharks have only five or six gills, the broadnose sevengill shark is one of only two species to bear — you guessed it — seven gills, a trait shared by primitive sharks more common in the Jurassic. Sevengills are one of the most common sharks in Tasmania’s Derwent River and the largest resident shark. Larger shark species visit the area only at certain times of the year. Sevengill sharks have a widespread distribution, occurring in the Atlantic, Indian and Pacific Oceans, mainly in temperate waters. 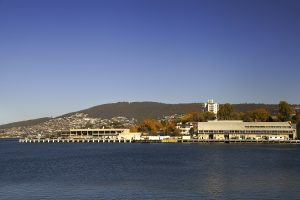 In southern Australia, they have been reported from Sydney to Perth, including Tasmania. Find out more about the specimens in our biological collections. Is the problem of storing things in formalin that the cells get zapped, are unclonable, dna too damaged. Why do it, apart from offending the noses and lungs of your workers? Good question. I’ve talked to John about it (the person quoted in the story). He said that formalin is the best fixative for fishes and the most commonly used. It prevents specimens from decaying and becoming soft or brittle. After fixation in formalin, which can take a few days to a few months depending on the size of the specimen, they transfer the specimen to 70% ethanol for long term storage. Seventy per cent ethanol is a better long-term preservative because it’s a safer chemical and is less likely to decalcify the specimen, which is more likely in formalin due to higher acidity. DNA chains are broken down into short fragments in formalin, so DNA is usually extracted from muscle samples before a specimen is fixed. We store DNA at around minus 80 degrees Celcius.